Windows Vista contains a range of new technologies and features that are intended to help network administrators and power users better manage their systems. 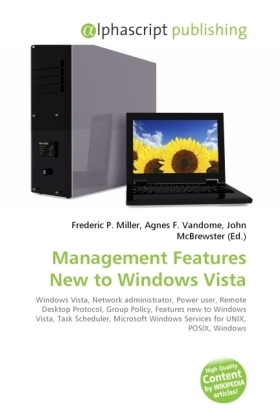 Notable changes include a complete replacement of the "Windows Setup" process, completely rewritten deployment mechanisms, support for per-application Remote Desktop sessions, new diagnostic and health monitoring tools, and a range of new Group Policy settings covering many of the features new to Windows Vista. Other areas of interest include major changes to Task Scheduler, as well as the addition of Subsystem for UNIX Applications, which provides a POSIX-compatible environment for applications as part of the operating system itself.